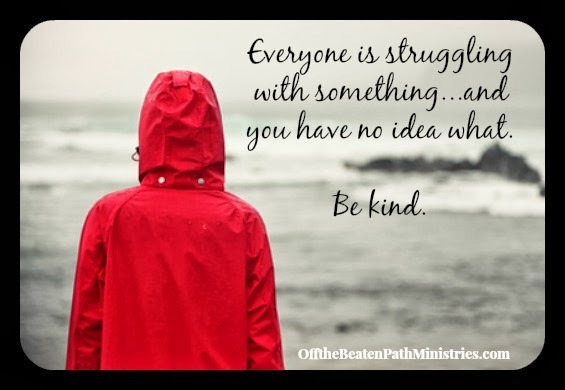 Off the Beaten Path: Struggling? Take Courage! You're Not Alone! Struggling? Take Courage! You're Not Alone! You may have noticed a melodramatic tone to my blog posts over the past few months. Look, I'm struggling. I don't mean to whine and I don't want to go on and on and on about my woes. In fact, I'm ready to be over them. So ready. But sometimes we go through seasons of struggling. Praise the Lord, I have not walked through this valley alone. My God has been so faithful, and walked with me every step. He has encouraged me and strengthened me, flooded me with joy when I thought all hope was lost. And He has worked. My, how He has worked. And He's not through. And dear friends and my husband and my daughter have walked with me through my struggles. They've been patient and tender and kind. And I'm oh so grateful. And they're probably all wondering, "Aren't we through with this yet?" Well, maybe. I'm not sure. Personal struggles don't all have neat beginnings and endings. I watched a movie recently in which all of the characters underwent huge internal and relational struggles. And at the end of the movie, there was a big smile and upbeat, quirky music and a beautiful sunset. As the credits rolled you were led to believe that the struggle was over, all was well. But in reality, struggles don't end like that usually. There are frayed edges and good intentions and a little momentum followed by a sudden halt in progression. There are smiles and sunshine, but then there are a few more tears and another mellow day. You dry your tears and put away the tissues, and then you have to go hunting for them again. You talk it out, hug and say all is well, but then it isn't again. Feelings are mended, but they're raw. Apologies are made, but they're fragile. Promises are offered, but conditions change, hearts change, minds change. I don't mean to depress you with all this talk of unfinished business and unresolved battles. But I do want to let you know that I understand what real, in-this-world struggles look like. So you may be struggling with something right now, too. You may be hurting or conflicted or wrestling with a stronghold. Maybe you're depressed or anxious or grieving. Maybe you've told some people about your hurt and your struggle, and they've counseled you and consoled you, but the struggle continues. Maybe you've sought counseling, but there are a lot of difficult moments and anxious thoughts and hard conversations in between the counseling sessions. Maybe you're weary from it all. Maybe you even feel like you're sinking and you're not going to ever get on top of this thing. And I don't have pat answers for you today. You are not alone. God is with you, for you, going ahead of you, picking up the rear, and holding your hand. He is guarding you and fighting for you and loving you all the way. And there are other sisters in Christ who want to be there to stand in the gap for you, too. True, no one else can fight your battles. But, as in the case of Aaron and Hur holding up the arms of Moses in the Israelites' battle against Amalek (Exodus 17:1-16), they can support you, pray for you and encourage you. For the next few days, I'll be blogging about some of the promises of God concerning our personal struggles. I hope these posts will encourage you in whatever battle you're fighting. Meanwhile, keep your eyes out for others who may be struggling. It's easy and tempting in the middle of a personal struggle to become inward focused. That's a huge mistake, right? Instead, there is great reward and healing in showing kindness, gentleness and grace to others who are walking a similar path. What are some of the ways we could all be a little more aware that people around us are weary and hurting from personal battles? What could we do to aide?